February 17th, 2008 : Cloudy and cool, Water Temps 45* to 50* and Clear. Caught bait early this morning and picked clients up at High Point at 6:30am. Checked a deep flat out but did not see what I wanted to on my depth finder so I set up on a 20 foot flat pulling boards and a bobber. We worked about 200 yards until we heard the reel screaming on the bobber rod and Steve picked it up. After 25 yards of drag got stripped off the reel the culprit surfaced, a loon. We could tell that it was wrapped up around its leg by the way it was moving so we wanted to get it untied and after a 30 minute battle we finally released it tired but unharmed. I checked all the lines and rebaited after the fiasco and resumed fishing. Early this morning the fish were lethargic and only wanted to kill the baits but as the morning progressed they started eating the baits allowing the guys to catch some Stripers. We had 34 strikes on that 20' flat in 3 hours before the action slowed. I then looked for more fish and set up on some deep fish and put downlines on them . We had a couple strikes and then Steve hooked a nice Striper and while he was fighting it a rod bent over which I thought was hung up. As I helped Steve land his fish I asked Dave to grab the other rod and free it up. 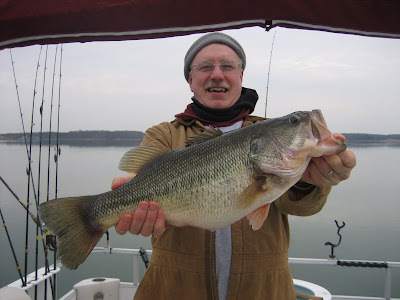 I asked him twice was it hung or was it a fish and he thought it must be hung by it not budging but after 30 seconds it started to move off and I knew we had a Hog on. Dave fought the fish for a couple of minutes before the line went slack and we all looked at each other in disbelief. The hook simply pulled out, nothing broke, just pulled out [a new sharp hook] ! We hung in there and I saw a fish come off the bottom moving for a bait and I alerted the guys to get ready and next thing we knew we had 4 fish on and in the boat to limit out for the day. 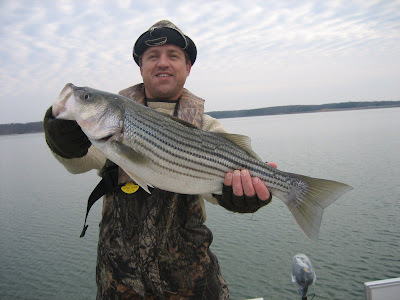 Pictured is Dave with a nice bass he caught and Steves first Striper of the morning. 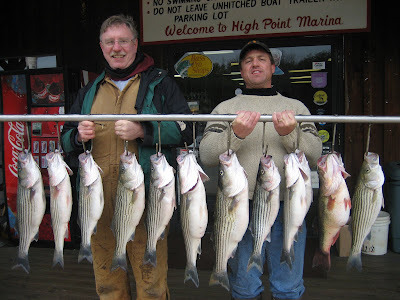 Today we had 45 strikes, boating 17 Stripers and a Bass , all by midday. We really nailed them today!